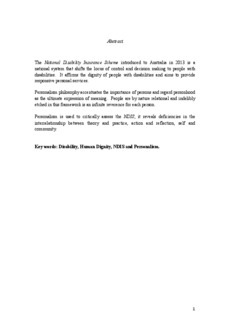 The National Disability Insurance Scheme introduced to Australia in 2013 is a national system that shifts the locus of control and decision making to people with disabilities. It affirms the dignity of people with disabilities and aims to provide responsive personal services. Personalism philosophy accentuates the importance of persons and regard personhood as the ultimate expression of meaning. People are by nature relational and indelibly etched in this framework is an infinite reverence for each person. 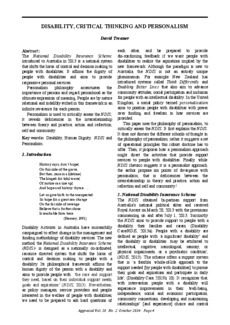 Personalism is used to critically assess the NDIS; it reveals deficiencies in the interrelationship between theory and practice, action and reflection, self and community.